Project the variables: we let the user explore variations involving parental leave, casual jobs in retirement, mortgage rate increases, inheritance, and many more! Together, Wealth Projector's gamified and holistic approach delivers a unique, game-changing product that makes a real difference to the financial literacy of everyday Australians. The financial services industry is big on listing assumptions. 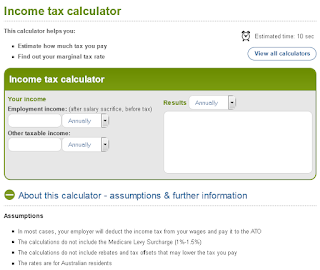 Take, for example, a simple Income Tax Calculator. 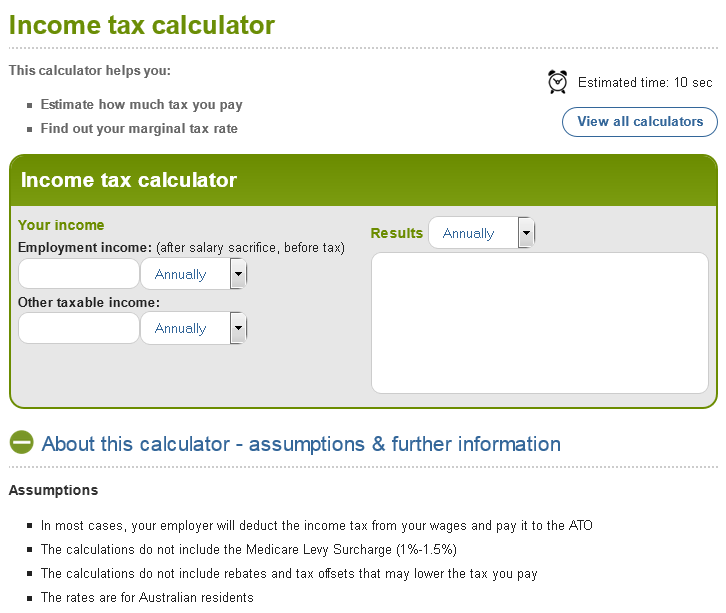 This calculator calculates income tax, given employment income and other taxable income. It explictly ignores several factors, which it lists at the bottom under Assumptions. "The calculations do not include rebates and tax offsets that may lower the tax you pay"
"If your income includes any rebates or tax offsets, this calculator is not meaningful for you"
For example, if some portion of a person's income comes from a negatively-geared investment property, this calculator is simply no good to them. We tend to treat assumptions as disclaimers, but assumptions are weaknesses: every assumption a calculator makes is effectively saying 'this calculator is not useful for anybody that doesn't fit this assumption'. And given how many assumptions are often listed, this can exclude a lot of people. As an industry, we should strive to minimise the amount we assume. In doing so, we maximise our usefulness. This requires a holistic approach to financial calculations, considering as many diverse aspects of a person's life as possible, in order to be truly meaningful. "Tim is renting a unit with girlfriend Jane. They are looking to buy their first home, and start a family. Can they afford it?" Once Tim and Jane decide the value of home they wish to buy, they can calculate their mortgage repayments. But this is not simply an additional expense, since they are already renting and can stop rental payments once they move. It is important for Tim and Jane to know, given their current rent, what their equivalent mortgage already is. Not all property expenses can be borrowed. Tim and Jane will need an upfront deposit, as well as stamp duty costs. Tim and Jane are at the start of a long financial journey. They can expect many new costs ahead of them: child care, schooling, renovations, and more. All these expenses will come during the life of the mortgage they are about to take on. Redirecting savings from cash into a home has implications for their pension, since the family home is not considered part of the Asset Test. Given this, how much pension will Tim and Jane receive? Factor number 3 is particularly important, since by the time Tim and Jane are in their most expensive years, it will be too late to change their mind if they find they cannot keep up with expenses. They need to know now, before they buy their new home, how things may look in 15 or 20 years time. "Being able to confidently navigate the financial landscape and make good decisions about money are core life skills every Australian needs. Improved financial literacy can benefit anyone, regardless of age or income. Being able to make the most of your money, manage financial risks and avoid financial pitfalls can have a positive impact on the financial wellbeing of individuals, families and communities." Australians need holistic financial education that can project their whole wealth picture over the course of their life. Only then can we expect to improve the financial literacy of everyday Australians. "Tim and Jane have a home, mortgage, and growing family. They would like to renovate their home to add room for their new child. They would also like to send their two children to private school one day. Can they afford it?" Tim and Jane will need to draw into the equity in their home to fund renovations. But how much equity do they have? What year did they buy the home, what is their current mortgage amount, and what is their suburb growth rate? Drawing into home equity will increase their mortgage repayments. It will push out the age at which they can expect to have paid off their mortage. So what is this new age? And how much are these new repayments? The lifetime of their new mortgage will encompass their children's schooling. So in the toughest years, when both children are at private school and they are still paying the mortgage, will they be able to keep up with expenses? If the mortgage repayments extend into their late 50's, will taking advantage of TTR help them? Factor number 3 is particularly important, because by the time Tim and Jane are in their toughest years it will be too late to change their mind. Tim and Jane need to know now, before they start renovations, how things may look in 5 or 10 years time. Unfortunately, the existing landscape of financial education tools in Australia does little to help. Yes there are web sites that can look up suburb growth rates, there are sites that can project mortgage repayments, and there are sites that can explore TTR. But it is unrealistic to expect Tim and Jane to combine all these calculations to answer their basic question. Many of the formulas involved interact in subtle ways. And it is easy to posit additional, complicating factors such as: what if Jane wants to stop working for a few years to spend time with her young family? What if Tim wants to pay for professional training courses, and ultimately increase his salary? What if they can expect inheritance one day? "Current illustration tools are inadequate for helping to make [decisions about the future]... Not only will more sophisticated advisor tools, illustrations, and calculators help to demonstrate value-adding analysis and advice, but the incorporation of such tools within a holistic financial planning framework will help to develop long-term relationships... Technology systems will have a major role to play in helping advisors and consumers to understand and analyse sophisticated [financial] products"
Only by having tools that can consider the whole of a family's wealth and dreams holistically, can we expect to improve the financial literacy of everyday Australians. Wealth Projector: To TTR Or Not To TTR? Transition to Retirement (TTR) is a strategy whereby individuals (who meet certain criteria) can draw down portions of their superannuation savings (up to 10% per year) before they reach retirement age. There are several reasons a person may want to do this. Firstly, they may want to reduce their working hours in order to enjoy more leisure time. They can use the drawdown from their super to 'top up' the salaried income they lose. Another popular, if counter-intuitive, idea is to take the money drawn down from super and immediately reinvest it back into super. Because of various tax rules, this can actually increase overall income. In a third scenario, a person may elect to take their drawn down superannuation and use it to accelerate their mortgage repayments. "if your mortgage interest rate is 6 per cent and your credit card interest rate is 16 per cent, it simply makes sense to pay off the debt with the highest interest rate". Equally, in some cases having a mortgage can actually be beneficial, such as a negatively-geared investment property. Other commenators point out repaying mortgages using TTR "may mean missing out on potential capital growth and high earnings if markets were to perform strongly". 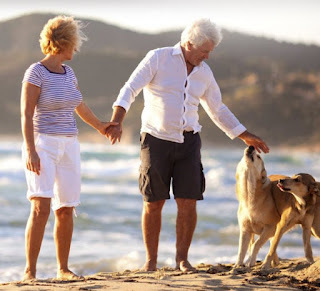 Finally, assuming no health problems, it may make sense to hold off on TTR and wait until you can access all of your superannuation tax-free at retirement. In many ways, using TTR to pay down a mortgage is the most conservative, risk-adverse choice. Assuming you don't already have worse debts (i.e. credit cards), the other reasons for not paying down a mortgage revolve around trying to make better returns elsewhere. Investing in rental properties, betting on market returns, and betting on medium-term health, are inherently riskier to varying degrees. Ultimately there's not a clear answer as to whether a person should adopt TTR or not. Where there is a clear answer, however, is whether a person should be educated about TTR. It's been observed that fewer than 40% of Australians have sought financial advice. This has serious implications for the adoption of TTR, which is not as widespread as it could be. For such an important, and potentially beneficial strategy, TTR is under utilised. No long-term wealth projection would be complete without considering TTR. For financial planners, having TTR front-and-centre in an educational tool is an excellent conversation starter, whether a person ultimately adopts it or not. "the relative expected contributions of the various pillars of retirement income (compulsory superannuation contributions, voluntary superannuation contributions, the Age Pension and voluntary savings)". They find that "ignoring the last of these pillars is a significant omission". Put simply, many traditional financial calculators are too simplistic in their approach. Consider, for example, projecting how much superannuation a client will have at retirement. Many traditional calculators simply take the current balance plus contributions (and less fees), and compound it over the client's working life. But what if the client has a partner? Clearly their family's 'superannuation at retirement' should include their partner's super. However we cannot just take the client's balance at retirement, and their partner's balance, and add them together. Because what if their partner retires a few years before them, and has therefore drawn into some super by the time the client retires? Or if their partner retires a few years later, such that the partner's portion of super cannot be unlocked at the client's retirement age? Such overlaps quickly complicate the 'balance at retirement' calculation. Equally, many calculators project 'required superannuation' by simply dividing the balance at retirement over the next 20-25 years, plus a little growth. But this misses the client's other income streams, such as the Age Pension, rental income or income from shares ("a significant omission"). Further complicating the issue is that these income streams may vary over time. For example the Age Pension Asset Test will be affected as the client gradually depletes their super or share portfolio. One can easily posit further factors which significantly affect wealth projections, such as: adopting a Transition To Retirement strategy; taking up a casual job in retirement; selling existing assets; redrawing into home equity; receiving inheritance income; and many more. In summary: it is overly simplistic, and potentially misleading, to consider any aspect of a client's wealth in isolation. Only by considering a complete, holistic picture of a client's wealth future can we offer meaningful and long-term assistance.